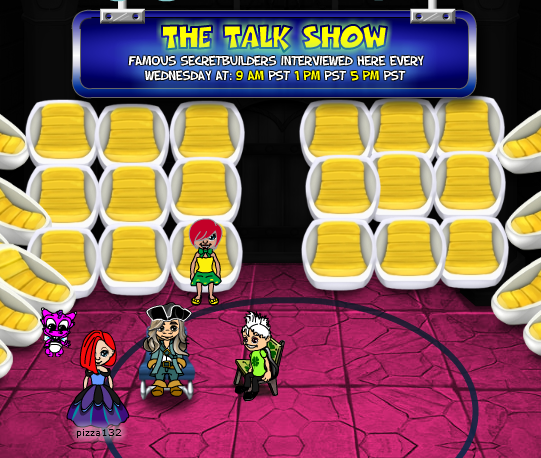 Do you know who was the special guest of today's Talk Show? No kidding - one of the greatest artists to have ever lived accepted our invitation and answered a number of questions about his life and career. I was able to snap the picture above minutes before the show started, while Mr. Da Vinci and our host, Joebar, were waiting for the audience to get in and get seated. Once the show started, questions were flowing from everywhere. Understandably, most questions were regarding Leonardo Da Vinci's most popular painting - the Mona Lisa. Our guest shared a very interesting fact - it took him 10 years to paint her smile!!! Isn't that amazing? Another fact that took the audience by surprise was the fact that Leonardo was not only an artist, but also a scientist and an inventor. He was the first to draw sketches of a helicopter, an airplane, a bicycle, a battleship... the list goes on and on. Mind you that he lived in the renaissance era, hundreds of years ago! He also invented the scissors - Who knew? Every Wednesday famous people are interviewed on the SecretBuilders Talk Show. Next week we expect a visit from Cleopatra. Curious what lesser known facts she would be willing to share? Mark your calendars and make sure you're going to attend. Come prepared with lots of good questions and you might even leave with a gift.